UP 6915, preserved by the Southern California chapter of the Railway and Locomotive Historical Society at the Los Angeles County Fairplex in Pomona, California. The EMD DD40AX was a 6,600 hp (4.9 MW) D-D diesel locomotive built by General Motors' Electro-Motive ision of La Grange, Illinois, for the Union Pacific Railroad. 47 locomotives were built between June 1969 and September 1971; they were numbered UP 6900–6946. The first locomotive, 6900, was delivered in time to participate in the celebrations of the 100th anniversary of the completion of the transcontinental railroad by driving a golden spike at Promontory Summit, Utah. The class was therefore named Centennial by the Union Pacific. The DD40AX is the longest diesel locomotive design ever built, at 98 ft 5 in (30 m). The locomotive frame length required exceeded the abilities of EMD's plant, so the frames were fabricated by an outside contractor, the John Mohr Company of Chicago. Even today, it is the most powerful diesel locomotive type ever built, although it achieves this by using two diesel prime movers. The 'X' in the designation stood for Experimental: the DD40AX locomotives were the testbeds for much technology that would go into future EMD products. They pioneered the modular electronic control systems later used on EMD's Dash-2 line of locomotives. For the first time, the locomotive was able to load-test itself, using its dynamic braking resistors as an electrical load so that external equipment was not required. The DDA40X used the wide-nosed cab from the FP45 cowl units. This design closely resembled the Canadian comfort cab used on nearly all hood unit diesels today, but predated it by two decades. As the DD40AX program was deemed a testbed, a number of experiments were conducted during the service life of these locomotives. 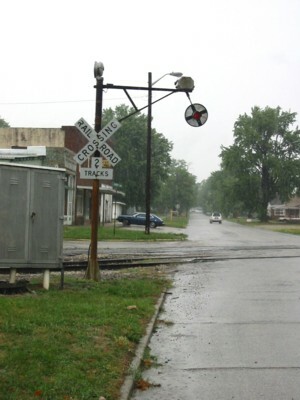 One such test included fitting a few of the units with air raid sirens in order to warn trackside personnel when away from grade crossings. These tests were inconclusive, however. The DD40AX is featured in the third sequel of the successful computer game series Railroad Tycoon under the name "DD40AX". "Bachmann has broken the sound barrier in N scale! Our first DCC sound equipped N scale locomotive, the EMD DD40AX, includes our Sound Value SoundTraxx® diesel sound package with prototypical prime movers (dual-motor sound), 3 air horns, and bell–all in 16-bit polyphonic sound. Dual motors with flywheels, operating “gumball” light, 16-wheel drive, lighted number boards, weathered air intakes and exhausts, and E-Z Mate® Mark II couplers. " a great place to research locomotives!